In this post I gladly announce that three problems that bothered me have been solved: The computational complexity of certifying RIP and NSP and the number of steps the homotopy method needs to obtain a solution of the Basis Pursuit problem. Theorem 1 Let a matrix , a positive integer and some be given. It is hard for NP under randomized polynomial-time reductions to check if satisfies the restricted isometry property. That does not yet say that it’s NP-hard to check if is an RIP constant for -sparse vectors but it’s close. I think that Dustin Mixon has explained this issue better on his blog than I could do here. Theorem 2 For a given matrix and a positive integer , it is NP-hard to compute the restricted isometry constant. Theorem 3 For a given matrix and a positive integer , the problem to decide whether satisfies the restricted isometry property of order for some constant is coNP-complete. Theorem 4 Let a matrix , a positive integer and some be given. It is coNP-complete to check if satisfies the restricted isometry property. Definition 5 A matrix satisfies the null space property of order if there is a constant such that for all elements in the null space of it holds that the sum of the largest absolute values of is smaller that times the 1-norm of . The smallest such constant is called the null space constant of order . 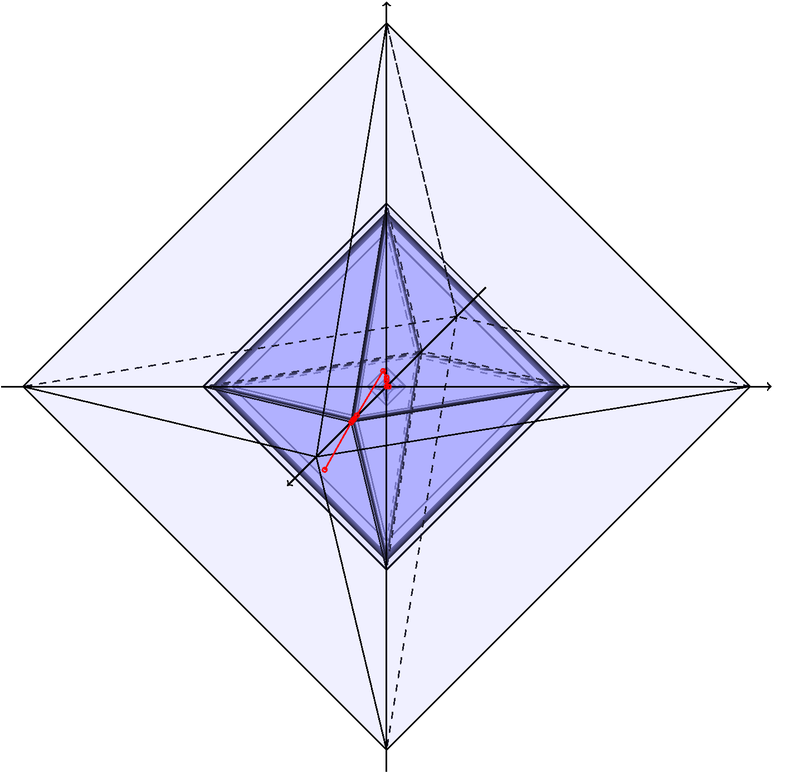 Theorem 6 F or a given matrix and a positive integer , the problem to decide whether satisfies the null space property order for some constant is coNP-complete. Consequently, it is NP-hard to compute the null space constant of . What is pretty interesting about the denoising variant is, that the solution (if it is unique throughout) depends on in a piecewise linear way and converges to the solution of basis pursuit for . This leads to an algorithm for the solution of basis pursuit: Start with (for which the unique solution is ), calculate the direction of the “solution path”, follow it until you reach a “break point”, calculate the next direction and so on until hits zero. This is for example implemented for MATLAB in L1Homotopy (the SPAMS package also seems to have this implemented, however, I haven’t used it yet). In practice, this approach (usually called homotopy method) is pretty fast and moreover, only detects a few break points. However, an obvious upper bound on the number of break point is exponential in the number of entries in . Hence, it seemed that one was faced with a situation similar to the simplex method for linear programming: The algorithms performs great an average but the worst case complexity is bad. That this is really true for linear programming is known since some time by the Klee-Minty example, an example for which the simplex method takes an exponential number of steps. What I asked myself for some time: Is there a Klee-Minty example for the homotopy method? Now the answer is there: Yes, there is! Then the homotopy path for the basis pursuit problem with matrix and right hand side has linear segments. The calculation of the new regularization path shows that it has exactly the announced number of 5 segments and the parameter of the smallest kink is . We calculate the regularization path, observe that it has the predicted 14 segments and that the parameter of the smallest kink is . It is not really easy to perceive the whole paths from the pictures because the magnitude of the entries vary strongly. I’ve drawn the path in red, each kink marked with a small circle. Moreover, I have drawn the according -balls of the respective radii to provide more geometric information. The paper by Mairal and Yu has more results of the paths if one looks for approximate solutions of the linear system but I will not go into detail about them here. 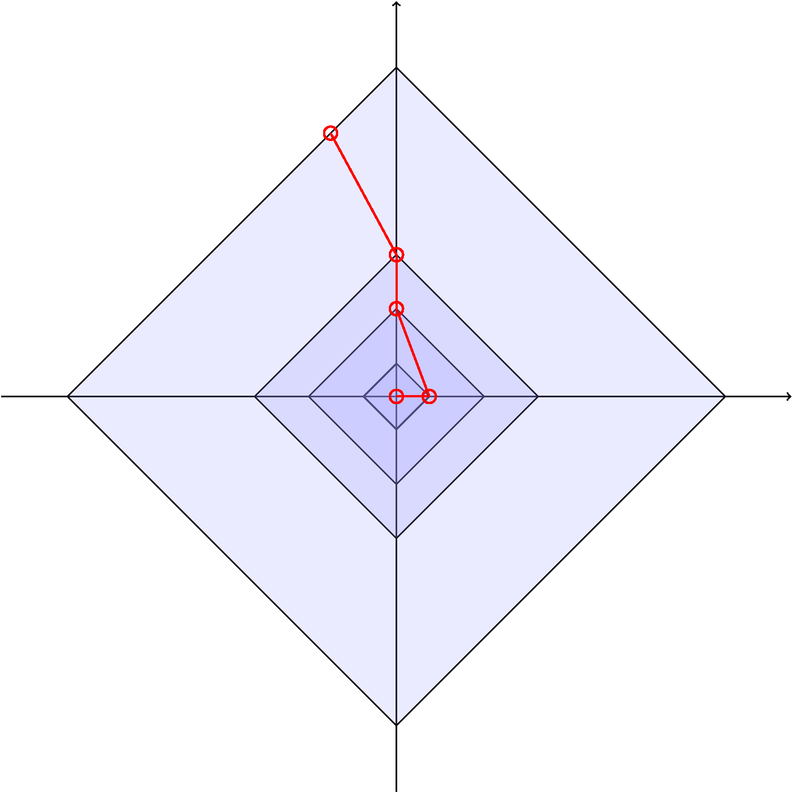 The Mairal-Yu example is . What is the worst case complexity for the true rectangular case? In other words: What is the complexity for in terms of and ?